MGM is remaking the movie FAME with a more diverse group of dancers. The story will still take place in the famed New York High School of Performing Arts, and follow a group of students from auditions to graduation day. We found a new video highlighting the new members of fame. One of the dancers is Anna Maria Perez de Taglé. You may remember her from Camp Rock and Hannah Montana. The part Filipino-American actress/singer is also the granddaughter of Filipino star Sylvia La Torre. This entry was posted in interview, movies on February 28, 2009 by Kevin Hsieh - channel APA. 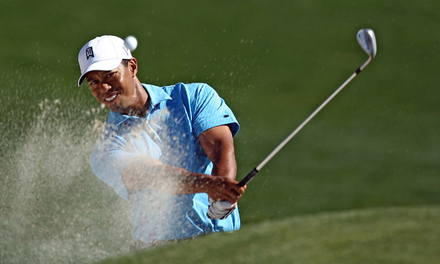 After an eight month absence, Tiger Woods got back on the links. He had to undergo reconstructive (ACL) surgery on his left knee and was out for the rest of the 2008 season after winning the 2008 U.S. Open. Looks like he’s back in shape and ready to play. Tiger Woods talked about what he missed the most prior to his return to competition at the 2009 World Golf Championships-Accenture Match Play Championship. After an eight month absence from the PGA TOUR Tiger Woods teed it up at the Ritz-Carlton Golf Club and talked about his knee rehabilitation at the 2009 World Golf Championships-Accenture Match Play Championship. Tiger Woods birdied his first hole and would go on to eagle the 13th hole to advance to the second round of the 2009 World Golf Championships – Accenture Match Play Championship. This entry was posted in interview, sports on February 28, 2009 by Kevin Hsieh - channel APA. You can get tickets to ISA SF 2009 here. Whether you are in SF or not, we’ve got FREE stuff you can win from Wong Fu Productions and Far*Est Movement. 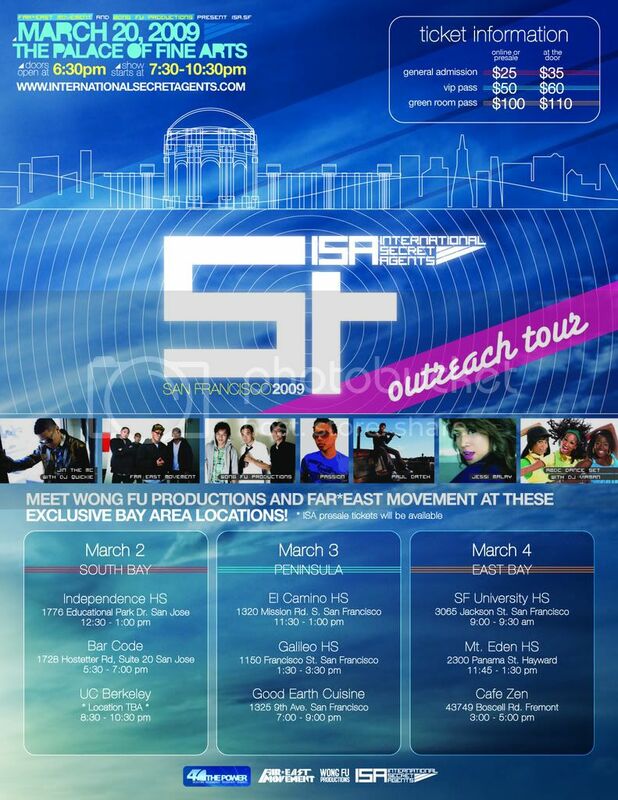 Here’s some of the things you can win an autographed ISA SF poster by Wong Fu and the Far-east Movement, an Autographed copy of FM’s new album “ANIMAL“, an autographed DVD from Wong Fu Productions, and just added win a pair of tickets to ISA Concert in San Francisco on March 20, 2009. Thanks to the Far East Movement and Wong Fu Productions for making this giveaway possible. This is how you can win. Email us at webmaster@channelapa.com or twitter us with “I want ISA swag” and let us know how you found us. Contest ends March 12th, 2009. Tell your friends and family. This entry was posted in events, movies, music, san francisco on February 27, 2009 by Kevin Hsieh - channel APA. Are you ready for Street Fighter: The Legend of Chun-Li? Smallville’s Krisitn Kreuk has the lead role of Chun-Li. The half-Caucasian/half-Asian beauty who gave up a life of privilege to become a street fighter, battles for those who cannot fight for themselves. Her kung fu master, Gen (Robin Shou), once a feared criminal, who now fights for the forces of good. All the action takes place on the streets of Bangkok. The action is also directed by Dion Lam of Matrix fame. It doesn’t look like it will be like the 1994 Jean-Claude Van Damme film with Ming-Na Wen as Chun-Li. Take a look at the action clip at the beginning of Kristin Kreuk’s interview on G4TV. If the movie is not enough for you, you can play Streetfighter IV on your favorite game console. This entry was posted in movies on February 27, 2009 by Kevin Hsieh - channel APA. Two b-boys meet two office ladies and try to impress them through their dance. They’re not impressed. The music and style should feel familiar cuz it is done by Planet B-boy director Benson Lee with music by Woody Pak. The video is actually a commercial for Southpole Clothing. Check out Planet B-boy if you haven’t. Last year Planet B-boy was released on DVD and Planet B-boy was at YouTube Live. This entry was posted in dance, shorts, youtube on February 27, 2009 by Kevin Hsieh - channel APA. This entry was posted in videogames on February 27, 2009 by Kevin Hsieh - channel APA.